Look, we all know that Pope Francis and his toadies are nefarious characters by now. I will have more to say about their efforts to schism and destroy as much of the Church Militant as possible using the Sixth Commandment as their primary locus of attack. HOWEVER, something happened yesterday that is far more subtle, but perhaps more intensely nefarious. Pope Francis Bergoglio announced that an Armenian theologian from the Tenth Century, Gregory of Narek, is going to be named a Doctor of the Universal Church. Yawn. Snooze. So what? Booooooring. Whatever. Gregory of Narek, while certainly a very holy man, was outside of communion with Rome, and also was a heretic, namely a Miaphysitite. Yawn. Snooze. So what? Booooooring. Technical. Whatever. No, not whatever. Miaphysitism holds that Christ has only one nature, which contains both a divine “character” and a human “character”. Miaphysitism is the heresy held by what are referred to today as the “Oriental Orthodox” churches, which includes among others the Armenians and also the Copts in Egypt. This is wrong. Christ is One Person with two natures: divine and human. Jesus Christ is FULLY GOD and FULLY MAN. This truth, given to the Church by the Holy Spirit at the Council of Chalcedon in ARSH 451, is technically referred to by Christological theologians as Dyophysitism. Recalling the post earlier this month about Extra Ecclesiam Nulla Salus, and logic, we must remind ourselves, as products of a diabolic system of post-Christian contra-education, that two contradictory premises cannot both be true. Period. And if we do in fact believe in the One, Holy, Catholic and Apostolic Church, then we KNOW and CANNOT DOUBT what the truth is in this case. The Church teaches infallibly that Dyophysitism is TRUE and everything else, including Miaphysitism is false, and thus heretical. Period. Full stop. End of story. Now here is the point, which is nuanced, especially to the post-modern, post-Christian mind of western man, so stay with me. Sentimentalism is not just a weakness, and is certainly not a virtue – it is confused with mercy – but a crime; and vicious sentimentalism is ordinary sentimentality raised up in place of principle. It is, as I said, poisoning the wells. It is not this law or this or that case, but law itself, justice itself that has been challenged, and it is only at the level of first principles that a proper defense can be made. The crisis in law and order today is not a legal one. It is a disaster at the level of first principles. Not just the courts, but our whole civilization sickens as it spreads. Sentimentalism, as the constitutive parts of the word imply, is the subjugation of the “mental” to the “sentient”. It is an attempt to found a philosophy on feeling. because it has to be one of those three. Sound familiar? This is exactly what it seems Francis and his cabal are trying to do with the Sixth Commandment. And the First Commandment is, at its core, more important than the Sixth. Therefore, in the big picture, this putative naming of Gregory of Narek as a Doctor of the Church, is actually worse. Oh yes. Yes we can. The Council of Chalcedon in ARSH 451 laid down the Church’s infallible teaching on this point, and appealing to mere political machinations as some sort of dispensation or justification for heresy is EXACTLY the sort of worldliness that the Enemy is so delighted to see come spewing from the Vatican, and especially from Pope Francis Bergoglio today. 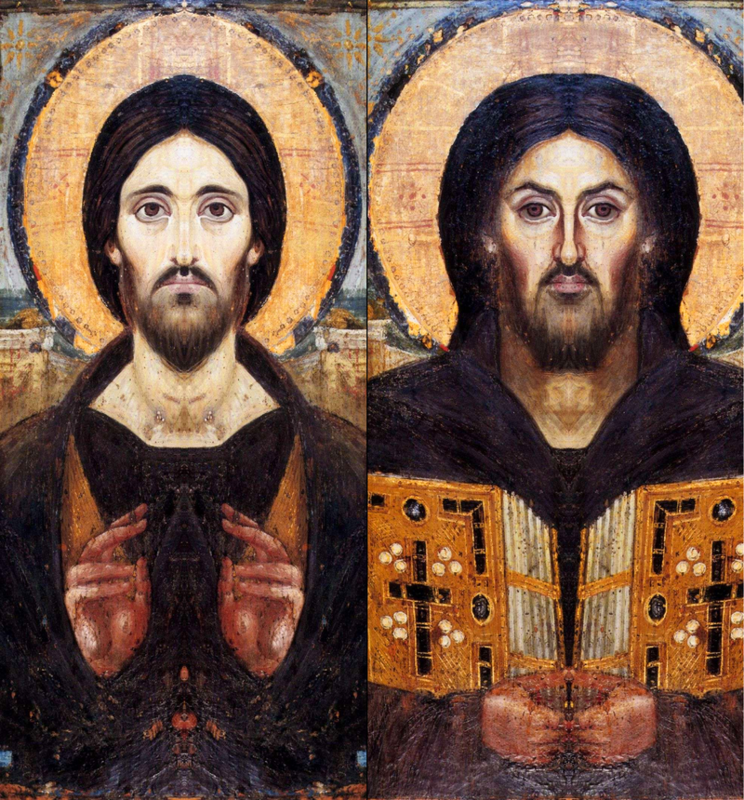 To end on a positive note, here is a photoshopped version of the icon of Christ Pantocrator – the best icon ever – which I posted immediately below in the “Starting Tuesday Off Right: First Commandment Edition”. The Cristos Pantocrator icon conveys the truth of Dyophysitism (Our Lord is One Person with two natures – divine and human). Look at the two sides of His face. They are quite different. Entire volumes could be written about this image, but for the purposes of this essay, let us just say that this icon communicates the two distinct natures of Christ, divine and human, dwelling in the One Person of Christ.